Preface. Section 1A. Linear Algebra. Van der Waerden conjecture and applications (G.P. Egorychev). Random matrices (V.L. Girko). Matrix equations. Factorization of matrix polynomials (A.N. Malyshev). Matrix functions (L. Rodman). Section 1B. Linear (In)dependence. Matroids (J.P.S. Kung). Section 1D. Fields, Galois Theory, and Algebraic Number Theory. Higher derivation Galois theory of inseparable field extensions (J.K. Deveney, J.N. Mordeson). Theory of local fields. Local class field theory. Higher local class field theory (I.B. Fesenko). Infinite Galois theory (M. Jarden). Finite fields and their applications (R. Lidl, H. Niederreiter). Global class field theory (W. Narkiewicz). Finite fields and error correcting codes (H. van Tilborg). Section 1F. Generalizations of Fields and Related Objects. Semi-rings and semi-fields (U. Hebisch, H.J. Weinert). Near-rings and near-fields (G.F. Pilz). Section 2A. Category Theory. Topos theory (S. MacLane, I. Moerdijk). Categorical structures (R.H. Street). Section 2B. 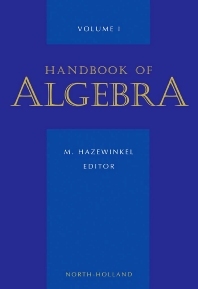 Homological Algebra. Cohomology. Cohomological Methods in Algebra. Homotopical Algebra. The cohomology of groups (J.F. Carlson). Relative homological algebra. Cohomology of categories, posets, and coalgebras (A.I. Generalov). Homotopy and homotopical algebra (J.F. Jardine). Derived categories and their uses (B. Keller). Section 3A. Commutative Rings and Algebras. Ideals and modules (J.-P. Lafon). Section 3B. Associative Rings and Algebras. Polynomial and power series rings. Free algebras, firs and semifirs (P.M. Cohn). Simple, prime, and semi-prime rings (V.K. Kharchenko). Algebraic microlocalization and modules with regular singularities over filtered rings (A.R.P. van den Essen). Frobenius rings (K. Yamagata). Subject Index.